These 10 steps to mindful parenting are also the keys to joyful parenting. 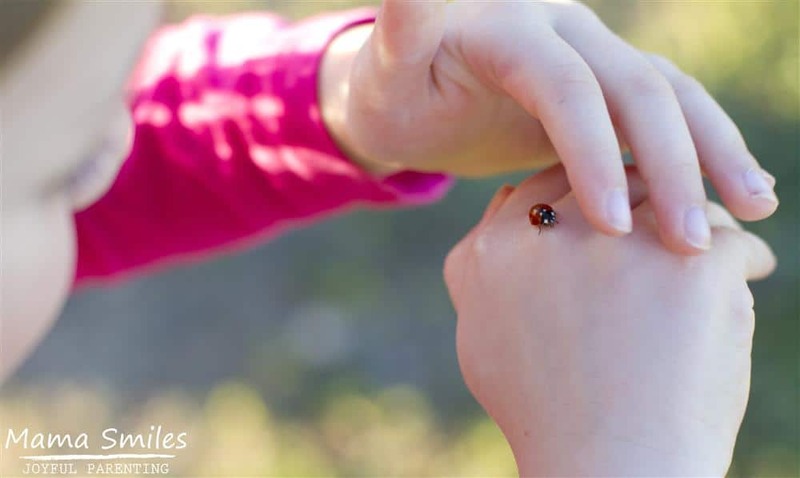 “Mama, look at this beautiful ladybug!” We spend the next 5 minutes admiring this ladybug, and then searching for another once the first flies away. My daughter is enthralled, and entirely absorbed in this activity. Soon it will be time to go home and cook dinner, but I decide to take this moment to live alongside her. Young children are, by nature, mindful. They live in the present and focus on what is happening right now. As we grow up, we learn to focus on the past in order to learn from our mistakes. We learn to think about the future in order to set and meet goals. We forget to live in the present. Parenting is a once-in-a-lifetime opportunity to re-learn mindfulness. Following these 10 steps to mindful parenting opens the door to joyful parenting. An old proverb states, “The eyes are the windows to the soul.” Looking your child in the eyes is one of the easiest ways to connect with them. It is also a wonderful way to be mindful of how your words and actions are impacting them. Children say so many things through their eyes that are not spoken with words. Make the most of this incredible channel for communication. Find a way to connect with our child early on in the day. Create a fun way to wake them up. Sit with them at the breakfast table. Make sure you give them a hug goodbye as they walk out the door to school. If you are home with your children, make time for a book or a short game before starting the day’s chores. It doesn’t take much to show your child that you are thinking of them. Children thrive on routines. So many things happen to them. We wake them up. We put them to bed. We get them dressed. We tell them to play. We tell them it is time to stop playing. Helping kids know what is going to happen when gives them some control over their lives. Morning and evening routines are particularly helpful. Pictures can help pre-reading children understand what is going to happen when. Laughter is one of the greatest gifts of life! When we laugh, we relax. Tension evaporates. Be silly with your kids. Let them know that it is okay to look ridiculous. It’s okay to make mistakes. It is okay to do things we aren’t good at – like dancing, in my case. I walk my kids to and from school, and I am always amazed at the little details they notice. A roly poly bug walking across the sidewalk who has to be rescued, in case someone steps on them. The beauty of dandelion fluff. When we focus on the small moments we enjoy parenting more and get to know our children better. Notice the little things that make your child unique. Learn their hopes and dreams. What makes your child happy? What makes them feel loved and cared for? Every child is different. Learning about the things that matter to your child will help you connect with them and meet their needs. One of my children thrives on quality time, while another longs to hear how much they are valued and loved. We can’t expect our children to meet our love languages, but being aware of what makes us feel loved and cared for will make us more aware as parents. Make sure you aren’t trying to make your child feel loved and cared for only in the ways you yourself would feel loved and cared for. Family traditions provide a family structure and predictability that children appreciate. Traditions can be simple or ornate. Find something that works for you and your family. Remember, too, that it is okay for traditions to change and evolve over the years as families grow and change. The best way to give our children permission to make mistakes is by being willing to admit that we make them ourselves. Remember that mistakes help us learn and grow. Sometimes our mistakes even turn out to be much better than whatever we planned on doing! Being willing to make mistakes is at the heart of modeling honesty in parenting. Don’t be afraid to let your kids know when you don’t know something. It’s okay as a parent to not understand what is going on. It is okay to not know what to do about a situation. The most important thing is to do your best while looking after your child – as best you can. Don’t be afraid to model asking for help, too. It takes a village to raise a child. It also takes a village to learn and grow as an adult. Getting outside with kids is one of the easiest ways to practice mindful parenting. Go on a family walk and let the kids lead. Take the time to see the beauty in weeds. Sit and look for shapes in the clouds. See the world through your child’s eyes. 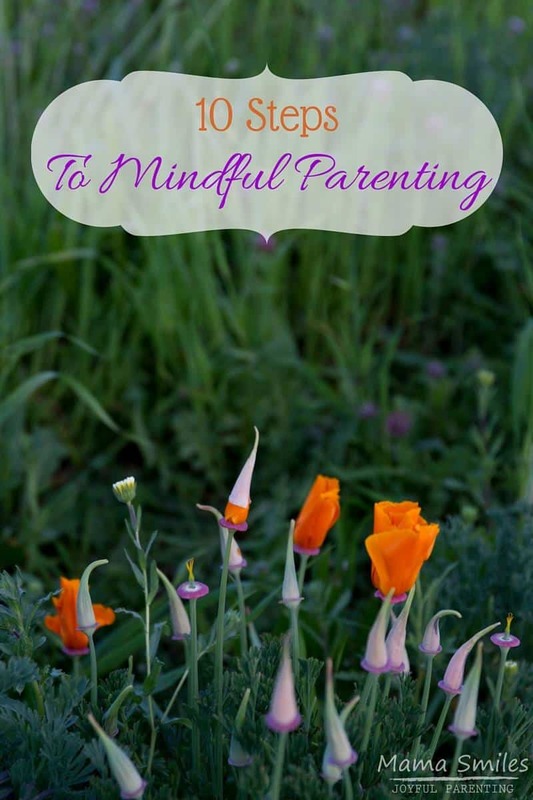 Do you agree with these 10 steps to mindful parenting? How do you practice mindful parenting in your home? Absolutely! This is a fantastic list. I focus on loving up my littlies by reading a book they choose, early in the day. It makes the rest of the day go much more smoothly if I take time for them first. The older kids can wait a bit, thankfully. Yes, I think the littles need top priority in the mornings, and you have a wonderful way to start the day! Great post! One of our tradition is that my 9 year old sits on my lap early in the morning and we talk about the day ahead. That helps to start it on the right note. I totally agree. It’s one I struggle with at times because I get so easily distracted. This is great. I do think that talking to them every day about what they are thinking whether it’s about their day and hearing over and over that school is boring is important. I find that getting them in the car to talk is helpful — I have two teen girls. I hear a lot too when I am driving carpools. That is one of the things I love about going on road trips with my kids – it gets them talking about all sorts of things!